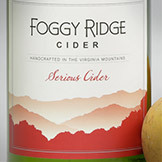 Foggy Ridge Cider has always begun in the orchard with cider apples carefully selected for flavor and grown for taste, not appearance. For over twenty years, we have aimed to put this fruit in the bottle with minimal manipulation. You won’t find hopped or oak flavored cider; we don’t flavor our hard won cider apples with additions. Instead, we aim to put the orchard in every bottle. While Foggy Ridge Cider released its last vintage in late 2017, the cidery has produced several cider blends in our 20 year history. See Cidermaker Jocelyn Kuzelka’s tasting notes below. 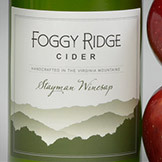 Foggy Ridge Final Call was our last cider bottled. This and a few other rare vintages are still available in limited supply at restaurants and shops. 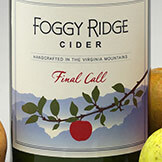 Final Call is Foggy Ridge Cider’s last and final cider release. A field blend (apples are “blended” in the orchard and pressed in mixed batches) of Foggy Ridge’s most valuable cider apples, Final Call is juicy mouth-filling cider with tart notes and a rich apple finish. Made from Harrison, Hewe’s Crab and Newtown Pippin, this balanced food friendly cider reflects Foggy Ridge’s 3000′ mountain terroir…our orchard to your glass. Serious Cider mixes traditional English cider apples like Tremlett’s Bitter and Dabinett with tart American favorites like Ashmead’s Kernel and Roxbury Russet. This crisp light food friendly cider is a refreshing aperitif paired with cheesy nibbles. 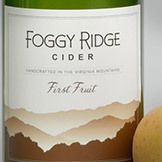 Foggy Ridge’s First Fruit cider blends early season American heirloom apples to create a rich fruity cider with lively acidity to drink, like Thomas Jefferson, on its own or with a meal. The famous Virginia Stayman apples ripen late in mountain orchards but are worth the wait. Our Stayman Winesap Cider blends the original Stayman apple with heirloom varieties like Grimes Golden and Cox’s Orange Pippin to create a lightly sweet cider to sip on its own or with spicy food. 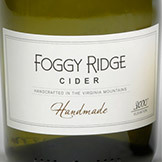 Foggy Ridge Handmade is bottled in baby champagne bottles and full of complex apple flavors. This crisp cider made from mostly Newtown Pippin apples with a hint of Gold Rush, and has beautiful soft tannins with light pear notes. Pippin Gold is a unique blend of 100% Newtown Pippin hard cider and apple brandy from Laird and Company, the country’s oldest distiller. 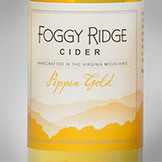 Pippin Gold is delicious as a dessert cider or sweet aperitif. Some have swooned over peaches soaked in Pippin Gold served with homemade pound cake. Made only when we have Arkansas Black and Black Twig apples, Pippin Black combines hard cider from Newtown Pippin and those late season “black apples” with Virginia apple brandy. To gild the lily we age this blend on Hungarian Oak. Butterscotch and caramel notes combine with rich apple flavor, making this apple port ideal with blue cheese and walnuts. 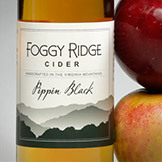 “Cider cider who’ll be the rider, saddle up the grey horse, gone to Foggy Ridge to get a case of cider.